Simply choose an old fashioned pineapple ice cream recipe and make a delicious homemade ice cream bursting with the fresh, exotic flavor of pineapple. Always a favorite, it can be served on any occasion, anytime. Use a fresh pineapple or the tinned variety if fresh pineapples are unavailable locally. This easy-to-make ice cream will taste delicious either way. One pound of fresh pineapple, half a pint of syrup in which a pineapple has been preserved, two or three slices of pineapple cut in small dice, and the juice of three lemons; pound or grate the pineapple, pass it through a sieve, mix, and freeze. Eight ounces of preserved pineapple, four slices cut in small dice, one quart of cream, the juice of three lemons, and sufficient syrup from the pineapple to sweeten it; pound the preserved pineapple, mix lemons with the cream, etc., and freeze. 1 quart of cream. 1 large ripe pineapple. 1 lb powdered sugar. Slice the pineapple thin, and scatter the sugar between the slices. Cover it, and let the fruit steep three hours. Then cut, or chop it up in the syrup, and strain it through a hair sieve or bag of double coarse lace. Beat gradually into the cream, and freeze as rapidly as possible. You may, if you like, reserve a few pieces of pineapple, non-sugared, cut into small square bits, and stir them through the cream when half-frozen. Pare and grate the pineapple and sprinkle sugar over it. Now freeze three pints of cream with one pound of pulverized sugar. When partly frozen, add the pineapple just as it is, or pressed through a sieve. Mom used to make this frozen ice cream mixture and freeze it in a container she set outside in the wintertime, but after she got her new refrigerator in the early 1950s, she used its freezer compartment instead. This frozen dessert always tasted delicious. Two cups shredded pineapple, one cup granulated sugar, two tablespoons confectioners' sugar, two cups whipping cream, half-cup coffee cream, one teaspoon vanilla, pinch of salt. Heat pineapple to boiling point with sugar. Remove from fire; add salt and cool. Whip cream; add vanilla and sugar. 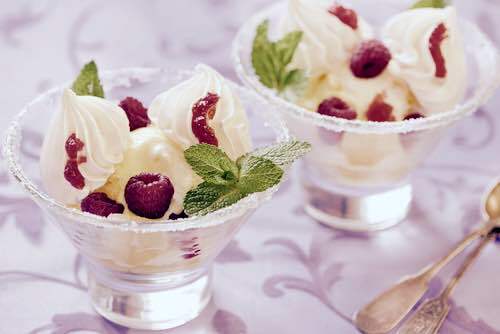 Fold whipped cream into fruit mixture and freeze.